It was a big day for me, it being my graduation from university, so obviously I was going to celebrate with burger #7. 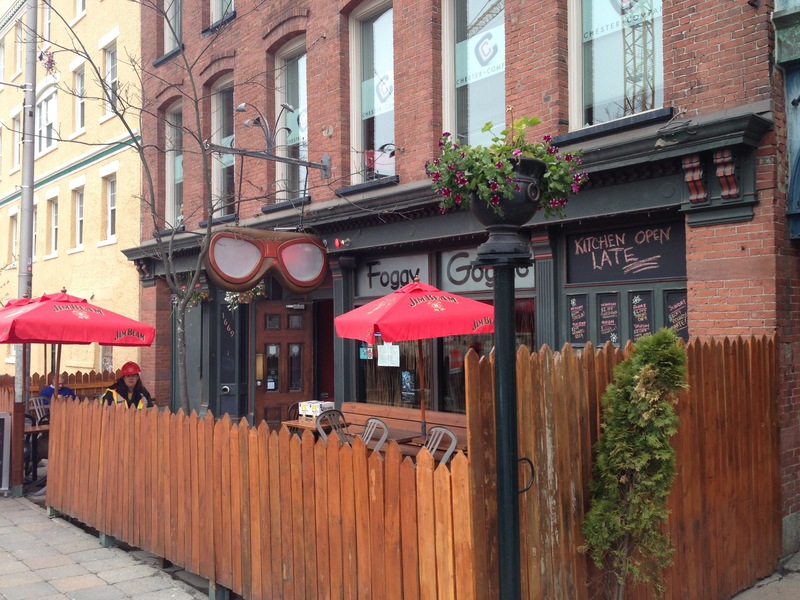 For the celebration, I went to The Foggy Goggle, which is located at 1667 Argyle Street. This was my first time at this place, but I had high hopes as Argyle Street tends to be full of creative and delicious meals. For this burger, I went with the Goggle Burger. This burger was placed in front of me and immediately my mouth started to water. 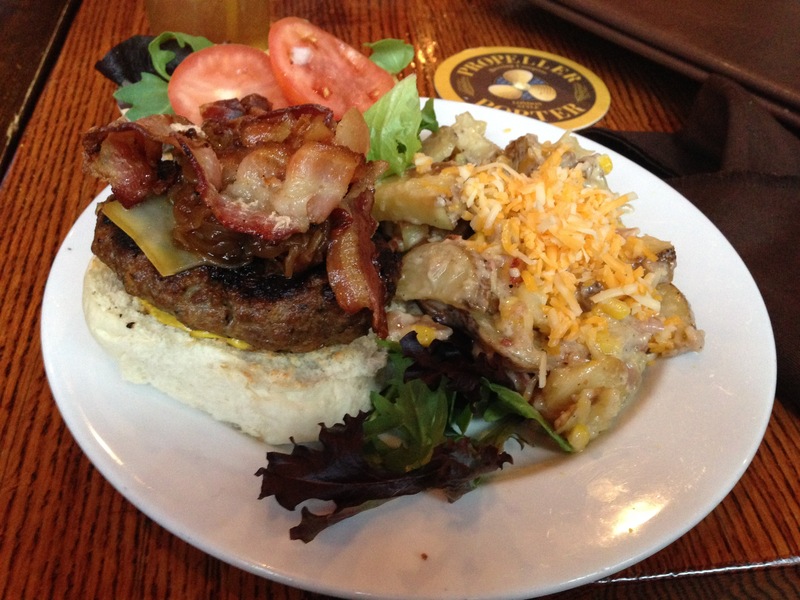 Instantly your eyes are drawn to the gracious amount of bacon that is piled on this burger. Even other people at the table commented on how good the bacon looked. After getting over the initial bacon daze, I noticed the aged smoked cheddar and the caramelized onions. Being someone who isn’t really that experienced with either of these styles of traditional burger toppings, I was eager to dive in and see how they all enhanced the burger. As was expected from the appearance, this burger was pretty delicious. The bacon and aged smoked cheddar tasted really awesome with the perfectly cooked hamburger patty. 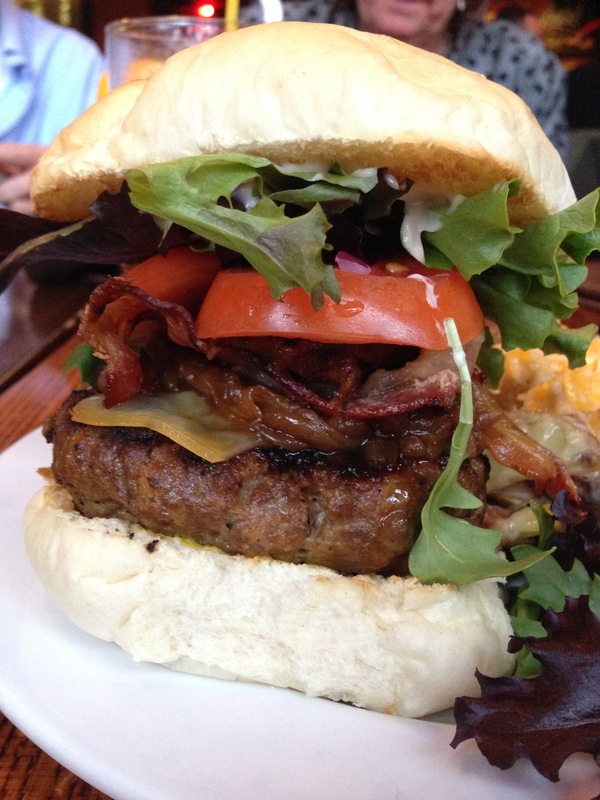 One pleasant surprise while eating this burger was the caramelized onions. I’m not a huge fan of onions (although that has been slightly changing since starting this journey) so I wasn’t sure what to expect from the ones on this burger. However, after a few bites, the onions actually turned out to be my favourite part. I really enjoyed the sweeter taste of them, and I thought that it really brought something special to this burger. For my side, I upgraded to the Foggy Spuds. These potatoes were covered in cheesy bacony goodness, and I have to insist that you go and try them at least once in your life. For the dinner, we had to make a reservation (there was 18 of us) and when we got there we were seated right beside the door. This didn’t really allow me to see the whole restaurant but from what I could make out, it seemed like a really nice place. The thing I really liked about this place was the fact that it felt like both a great location to come a get a casual meal, but it also felt as though it would be a great spot to come and have some drinks without the crowdedness of a more popular bar. Our waitress was extremely friendly and nice, and she never seemed like she was overwhelmed by this large group of 18 people, which can be a pretty daunting task for one person. This burger comes with a price of $14. This is a very common price for a burger of this caliber, and I think it is pretty fair. With the impressive amount of bacon that you get, it’s hard to argue with the cost, and I was also so pleased with those onions that I couldn’t really complain. I was very happy with my visit to The Foggy Goggle. It was a pretty special day in my life, so I was pleased when I got to eat a delicious burger in a stress-free environment. Even if you aren’t a huge burger fan, there are many other delicious options to try from their menu (the mac and cheese being one of them), so you should definitely go and give them a shot.